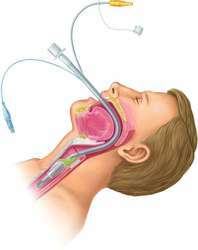 passage of a tube through the nose or mouth into the trachea for maintenance of the airway during anesthesia, or for ventilatory support or for maintenance of an imperiled airway. the management of the patient with an airway catheter inserted through the mouth or nose into the trachea. 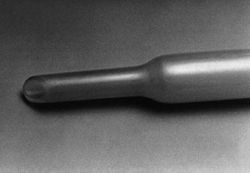 An endotracheal tube may be used to maintain a patent airway, to prevent aspiration of material from the digestive tract in the unconscious or paralyzed patient, to permit suctioning of tracheobronchial secretions, or to administer positive-pressure ventilation that cannot be given effectively by a mask. Endotracheal tubes may be made of rubber or plastic and usually have an inflatable cuff to maintain a closed system with the ventilator. method With the aid of paralytic agents to ease the passage, the endotracheal tube is inserted via the mouth or nose through the larynx into the trachea. If the oral route is used, a bite block may be required to prevent the patient from biting and obstructing the tube. Breath sounds are auscultated immediately after insertion and every 1 or 2 hours thereafter to make certain the tube is properly positioned and is not obstructing one of the mainstem bronchi. Once the tube is correctly positioned, it is taped securely in place and checked for patency and slippage every 15 to 60 minutes or per institutional protocol. The trachea is suctioned every hour and as needed, as indicated by patient assessment (dyspnea, gurgling, respirations, activation of ventilator pressure alarms). If so ordered, the trachea is irrigated with normal saline solution. The patient is usually on intermittent positive-pressure breathing (IPPB) or a volume respirator with the cuff of the endotracheal tube inflated. If the patient can breathe independently, the trachea and mouth are suctioned, the cuff is deflated, and the respiratory rate and quality are checked hourly. The patient is turned every 1 to 2 hours, and the blood pressure and pulse checked every 2 to 4 hours or according to institutional protocol. Parenteral fluids are administered as ordered. Nothing is given orally. Fluid intake and output are measured and recorded. The patient's level of consciousness is determined hourly, and, if he or she is sufficiently conscious, a method of communication is established. nursing orders The nurse monitors the position and patency of the endotracheal tube, performs the necessary suctioning, inflates and deflates the cuff at appropriate times, and administers IPPB or support with the volume respirator. The nurse checks the vital signs at specified intervals and provides emotional support and physical care for the patient, who is usually acutely ill, unable to communicate, and suffering from the discomfort of an endotracheal tube. outcome criteria Meticulous assessment of the patient with an endotracheal tube can promote the survival of a critically ill person. Passage of a tube into trachea to maintain airway during anesthesia. one with a tapered shape with no cuff; designed to be fitted with a wider shoulder at the larynx and narrow end in the trachea. Used in horses. an airway catheter inserted in the trachea during endotracheal intubation to assure patency of the upper airway by allowing for removal of secretions and maintenance of an adequate air passage. In animals, endotracheal intubation is usually accomplished through the mouth using an orotracheal tube. an endotracheal tube designed to be passed through the nasal cavity into the trachea. It usually has a thin wall. a spiral wire or nylon strip is incorporated into the wall to reduce the risk of collapse or kinking. a variety of endotracheal tubes is available. The tubes are almost always 'cuffed' to allow for their use with a mechanical ventilator. The cuff is a rubber balloon-like device that fits over the lower end of the tube. It is attached to a narrow tube that extends outside the body and allows for inflation of the cuff. Once the cuff is inflated there is no flow of air through the trachea other than that going through the endotracheal tube. Impact of an anesthesiology rotation on subsequent endotracheal intubation success. The results showed that the air within 100–200 cm of the endotracheal intubation site is contaminated after open suctioning. A comparative study of efficacy of esmolol and fentanyl for pressure attenuation during laryngoscopy and endotracheal intubation. 5 mg/kg body weight was administered intravenously at about 5 min before endotracheal intubation in the present series. In retrospective studies, endotracheal intubation has been associated with a 6%-25% incidence of unrecognized tube misplacement or displacement (16). To decrease the prevalence of injuries due to oral intubation, techniques of endotracheal intubation should be carefully employed. Criteria for estimating likelihood of difficultyof endotracheal intubation with the Macintosh laryngoscope. Among the multitude of potential advantages in its use the most important are: the avoidance of complications related to laryngoscopy and endotracheal intubation drastic reduction of descending infections related to intubation in children who have had a recent upper respiratory tract infection; reduced tracheal aspiration and a less irritable recovery from anaesthesia. The Trachway intubating stylet is a new patented FDA-registered intubating stylet for endotracheal intubation. Previous studies have also identified several risk factors associated with MEE in ICU patients: age greater than 50 years, prolonged (>7 days) oral endotracheal intubation, and an altered level of consciousness (i. In 1929 and 1930, while visiting the United Kingdom, Troup was himself instructed on endotracheal intubation by Magill.